We are blessed to support Arsenal. Not many clubs can boast such a rich history as ours. This doesn’t just mean trophies and titles. It can mean the players we had, the difference we made to the game itself, and proud records that stand the test of time. When you think of our rich tapestry, most recall Herbert Chapman, and rightly so. The visionary that joined from Huddersfield Town dragged Arsenal – and the game – up from its haunches and the amends he suggested are still part of the fabric of the game we know now. Chapman deservedly dominates thought, but I am here to say that there is another who deserves the same level of adulation – and that while I was aware of his name previously, I had no scope of the measure of the man until I was told about it. So here I am trying to make sure as many Gooners are aware of this extraordinary man, his feats and above all – how he put Arsenal above all. Just like I was made aware. We may be blessed to be Gooners, but it is people like Tom Whittaker that have made it so. Mr Whittaker devoted his entire working life to Arsenal, giving an entirely new definition to a ‘one-club man.’ From his playing days he moved into a physio role, then moving up to become a coach and finally, the manager. Such is the strength of his presence that Arsenal didn’t win a single trophy without him in some capacity until 1970. Seeing as he played for the club in the ‘20’s, that’s quite the stretch. Whittaker began his coaching career under Chapman, while still younger than some of the players. His broken kneecap suffered during his playing career had forced his hand and Whittaker wanted to continue in the sport in some capacity, so studied to become a physio, and went on to make major changes in the way the club maintained the fitness of the squad. He was at a forward thinking club under Chapman, and his methods were recognised by England, who appointed him to become one of their trainers. After George Allison – Chapman’s successor – retired in 1947, it would be Whittaker who would take the reins, completing a remarkable career transformation – all under the umbrella of one club. Whittaker was overseeing the slow demise of Arsenal as the powerhouse of English football, so his title-winning triumphs of 1947/48 and 1952/53, as well as the FA Cup in 1950, were all the more remarkable and added to the lustre of Whittaker’s reputation. He passed away in 1956 while still in the role of Manager. He had worked for Arsenal for nearly four decades. This is not referenced enough. Before finding this info out (thanks to Tim Stillman), I had known of Whittaker, but not of the magnitude of his heroics. Whittaker IS Arsenal, just as much as Herbert Chapman is Arsenal. It is criminal how underappreciated he is, and I feel almost guilty for not recognising him for the cornerstone of Arsenal that he is. This is why I hope even one person reads this and it sticks in their mind. I want Gooners to know that while the present day is pressing, the reason we can enjoy supporting Arsenal is down to Chapman AND Whittaker. We were blessed to have two men who went above and beyond, and word needs to be spread. ‹ PreviousSquare Pegs In Round Holes – Xhaka at LB? I 100% unreservedly agree with your article. Tom Whittaker was the Arsenal Manager when I first became a ‘Gooner’ in 1950 and I had the good fortune to watch his team (and mine) win the FA cup and continued my support as they won the league in 1952/3 as you state. I must confess that I too have not been as strong an advocate of Tom as I should have been, he truly was a “Mr Arsenal” and long may he be promoted as such. Proudly I can reclaim some dignity as I have ownership of his book – ‘Tom Whittaker’s Arsenal Story’, the foreword of which is written by Sir Bracewell Smith who was the Chairman of Arsenal Football Club (much more respected in his time than the current one is I suspect) who’s glowing comments do some justice to Tom’s service, achievements and loyalty. Tom Whittaker was an outstanding man and an Arsenal great who should be honoured with a bust. Whilst Herbert Chapman was the founder of our greatness and the man who created the blueprint (not only for Arsenal but for other clubs who became legends via his initiatives). Tom was the soldier who became the General who carried forward the colours. Sort of puts events of the recent past in to some perspective. What a wonderful comment Leo. You surmised brilliantly and how brilliant it would have been to see his teams in action as you have. Goonersphere The finest Arsenal blogging site. Packed to the brim with eclectic Arsenal content written by a grand collection of bloggers. A must. North London Is Red A site that is a must for all Gooners. Piebury Corner Make this place a must on matchdays. The finest pies, great ales & top tunes. All with a Gunners twist! The Armchair Gooner A fine read that concentrates on the greatest team the world has ever seen. A highly interesting read. The Arsenal History THE font of Arsenal knowledge. You need to know anything about our club, the boys that run this site are the Guru’s with the info. The Gooner Fanzine The Gooner Fanzine. The famous mag you buy outside the Ems but now on the net! 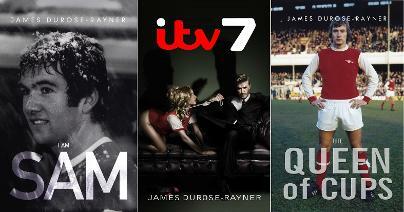 I Am Sam, ITV7 and Queen of Cups - Thrilling reads! Make it part of yoour Emirates pilgrimage!